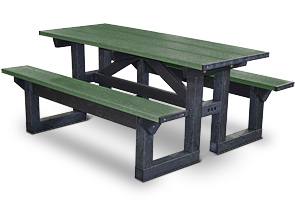 Impress the community with these attractive, eco-friendly Recycled Plastic Step Through Picnic Tables. Providing plenty of leg room, convenient entry and easy exit these tables are great for areas where step-over seating is just not ideal. The recycled plastic construction looks great and is very durable, no maintenance is necessary and it will never crack or peel. The tops and seats come factory assembled for easy field assembly. Simply bolt together with the hex head lag screws in the pre-drilled holes and job done!